Several Boca online publications and emails to residents indicate that Compson and Associates are proposing another ambitious project for Boca. 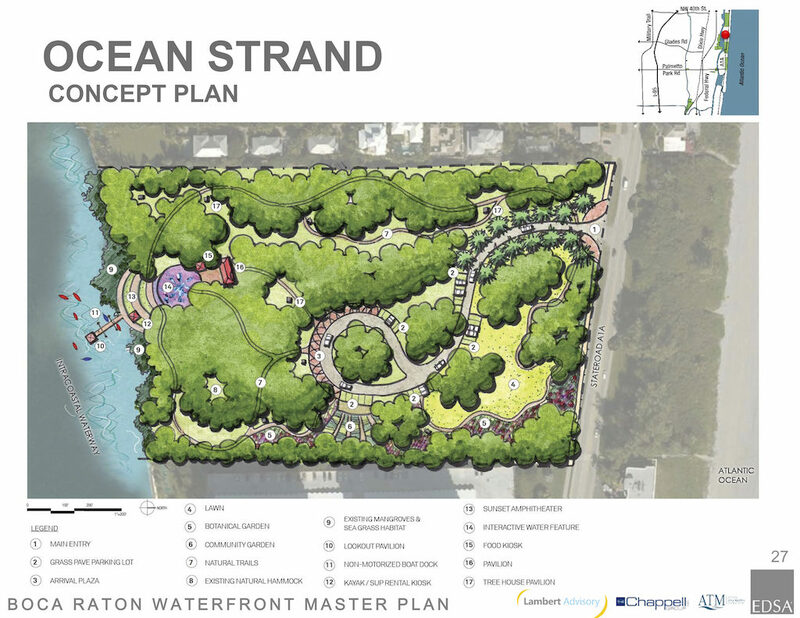 The new project is to develop the Ocean Strand property owned by the Boca Beach and Parks District. Boca Raton residents get early warnings of proposed development projects in the City’s monthly Development Services Review report. But, the March 2019 report does not include any information on Ocean Strand. It appears that the real estate developers are meeting with select Boca Raton Residents and City Officials in order to create favorable awareness for their concept. It appears that the real estate developers are meeting with select Boca Raton Residents and City Officials in order to create favorable awareness for their concept. That concept consists of two 11 story towers. Tower one would be a 160-room hotel and tower two would be 120 condo units. In addition to the towers, the concept includes a tunnel under A1A to the beach and a marina with restaurant on the Intracoastal. Both marina and tunnel are suggested to be open to the public. Ocean Strand is a piece of property that spans from the intracoastal to the ocean similar to Spanish River Park. It’s located between Gumbo Limbo and Spanish River Park, and has been targeted by developers before. The Greater Boca Raton Beach and Park District acquired Ocean Strand in 1994 to prevent proposed commercial developments. Additionally, it is part of the City Waterfront Master Plan developed by consultant EDSA. At the time, Boca Raton City Officials appeared to be willing to sell Ocean Strand for commercial development. Residents in neighborhoods surrounding Ocean Strand organized an effort to persuade City Officials to preserve Ocean Strand as a park. In 2010, Penn-Florida (the developers of the large Via Mizner building on Federal Highway) suggested they purchase Ocean Strand and build a beach club for exclusive use by Via Mizner residents. At the time, Boca Raton City Officials appeared to be willing to sell Ocean Strand for commercial development. Residents in neighborhoods surrounding Ocean Strand organized an effort to persuade City Officials to preserve Ocean Strand as a park. For years, residents petitioned for an ordinance that would prevent commercial development on Ocean Strand. However, the City took legal action against the residents. After a lengthy legal battle, which the City lost, the residents prevailed and Ordinance 5228 was adopted in 2013. Ordinance 5228 states: “All public-owned lands owned by the City and the Greater Boca Raton Beach and Park District located between the Intracoastal Waterway and the Atlantic Ocean shall be limited to public uses and public services provided for the general public, and development for private uses (including members-only beach clubs) on these public-owned lands shall be prohibited.” In 2016, residents again petitioned for an ordinance that would prevent commercial development on city owned Intracoastal land. At the time, several officials wanted a Houston’s Restaurant on public land. But after the citizen referendum, the Wildflower and other city owned waterfront properties became protected under Ordinance 5356. At the time, several officials wanted a Houston’s Restaurant on public land. But after the citizen referendum, the Wildflower and other city owned waterfront properties became protected under Ordinance 5356. However, unless there is some fine print somewhere, it appears that Ocean Strand is not included in Ordinance 5356, because it is owned by Boca Raton’s Beach and Parks District, not the City. If so, then if Boca Raton’s Beach and Parks District decides to sell Ocean Strand, all Boca City Officials can do is approve/deny development as it would any other development proposal. At the March 18th Greater Boca Raton Beach and Park District meeting several residents expressed their opposition to developing the Ocean Strand area which is owned by the district. When the commissioners were asked if they had a proposal from a developer they said no. As regards selling the property, Steve Engel said “Over my dead body”. Craig Ernst said he would vote for “what is best for the community so they don’t have to raise taxes … at this point I can’t say yes or no”. It has been made clear since 1994, that residents do not want Ocean Strand to be developed into commercial use. 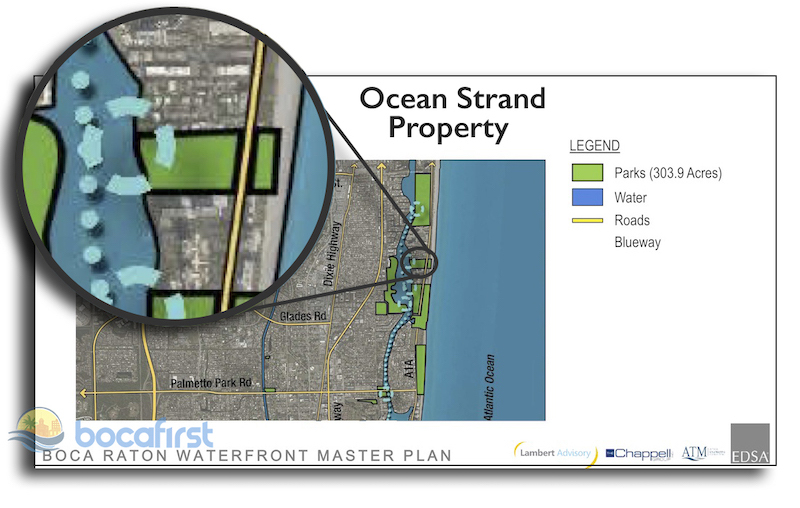 The City’s Comprehensive Waterfront Plan consultant, EDSA included a conceptual design for Ocean Strand when it did a comprehensive analysis of Boca’s parks. Compson and Associates are the developers currently constructing the huge project behind the downtown Post Office dubbed Tower 155. BocaFirst will continue to follow and report on the proposed development of Ocean Strand. Joe Graubart was born in Wilkes-Barre, Pennsylvania. He has lived on Miami Beach, Surfside Florida since childhoodwhen his parents, Samuel and Shirley, and brother David moved here in 1957. Joe is an alumnus of Miami Beach Senior High School. He received his Bachelor’s Degree from Florida International University. 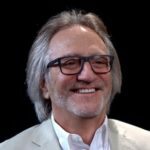 He has previously served one term each as Vice Mayor and Commissioner, and two terms as Chair of the Planning and Zoning Board, having served three different Mayoral administrations. Joe has called Boca his home since January of 2015; and enjoys giving back to this wonderful slice of paradise.